Karlův most (Charles Bridge), Karlova univerzita (Charles University), Karlovo náměstí (Charles Square), Karlštejn – castle and village near Prague, Karlovy Vary – a well-known spa in western Bohemia. Why Charles and who was he? Charles IV (Czech: Karel IV. (1316 – 1378) is the most famous King of Bohemia. He was the second king of Bohemia from the House of Luxembourg, and the first king of Bohemia to also become Holy Roman Emperor. His mother was Elizabeth of Bohemia (Czech: Eliška Přemyslovna), a princess of the Bohemian Přemyslid dynasty who became queen consort of Bohemia as the first wife of King John the Blind (John of Luxembourg). Charles IV received French education and was literate and fluent in five languages: Czech, French, German, Italian and Latin. He was crowned the Holy Roman Emperor in Bonn in 1346. His father was an important commander crossing Europe and taking part in many battles. However, his passion for wars ruined the Czech Lands. Charles IV started to reconstruct the King and Emperor’s power and the country itself. It was in 1344 when he founded together with his father Chrám sv. Víta (St. Vitus Cathedral) in Prague Castle. The Cathedral was finished in 1929. If we would like to describe the activities and merits of Charles, we must mention that he founded the University of Prague (named Charles University later), the first university north of the Alps, a new quarter of Prague – Nové Město pražské (New Town of Prague) and a large castle close to Prague as a safeguard for the Czech coronation jewels. Everything was carried out in 1348 at the age of 32. The year was sad for him as his first and beloved wife Blanche de Valois died. He was married four times. All his marriages allowed him to enlargen the Czech Lands area. The best known was the last one – Elizabeth of Pomorania thanks to her ability to break swords. When Charles came to Bohemia after his years spent in France in 1333, Prague Castle was dilapidated and all the royal castles were mortgaged and therefore he even had to live in a city house. Thanks to his decisions, Prague became one of the largest and most beautiful cities in Europe. However his influence crossed over the boundary of the Czech Lands. His reign can be characterized as a transformation in the nature of the Empire and is remembered as the Golden Age of Bohemia. He organized the states of the empire into peace-keeping confederations. In these, the Imperial cities figured prominently. 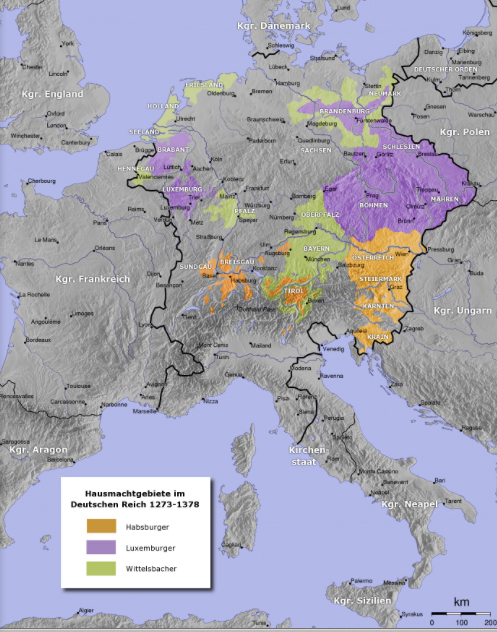 The Swabian Landfriede confederation of 1370 was made up almost entirely of Imperial Cities. He is famous also by bringing the first grapevine from France. The vineyards are still in many places in my country and produce wine of a high quality. He is still regarded as Pater Patriae (father of the country or otec vlasti), a title first coined by Adalbertus Ranconis de Ericinio at his funeral. This issue of the ISPRS eBulletin offers for the first time joint contents of ongoing activities of ISPRS and The ISPRS Foundation (TIF). ISPRS Council and the TIF Executive Committee decided to use this medium to disseminate current information amongst the ISPRS community, to inform not only about ISPRS affairs, but also to give notice of recent developments within TIF and its plans for offering travel grants for the Midterm Symposia. ISPRS Council is very grateful to both, TIF and its donors, for the supporting the activities in photogrammetry, remote sensing and spatial information sciences carried out by ISPRS. Without this support, in particular young scientists from less favoured nations and regions in the world would have less chance to actively participate in ISPRS. Council also believes that it is a good idea to disseminate news of the society and the foundation through the same medium, since this underlines tight connection of the two organisations. The ISPRS Foundation (TIF) was established during the ISPRS Congress in Istanbul in 2004 and since then has been active in providing financial assistance for ISPRS affairs. In comparison with other international foundations TIF is still young. Therefore, our financial resources are limited. But so far TIF has successfully managed to increase fund raising and to provide grants to assist qualified individuals and organizations around the world. Furthermore it supports all kinds of innovation and knowledge dissemination for advancing the sciences and technologies of ISPRS. TIF offers several awards, such as awareness education, distance learning, exchange programs, fellowships, grants, internships, preservation and archiving, research initiatives, scholarships, standards projects, tools and literature and travel grants. TIF finances are governed by Bylaws according to regulations for exemption from US Federal and other taxation. The Bylaws provide for controlling the outflow of annual grant funds and therefore restrict the annual amount. For example, the annual amount spent 2012 was extraordinarily high, in total US$ 39,907 – in 2013 TIF spent in total close to US$12,000. The TIF Board of Trustees approves every finance item to be covered by TIF. For 2014, the year of the ISPRS Midterm Symposia, TIF is ready to offer travel grants for all 8 events. Please visit the announcements below. The ISPRS Foundation offers travel grants to participate in the 2014 ISPRS Midterm Symposia http://www.isprs.org/society/midterm.aspx. The Board of Trustees of The ISPRS Foundation is pleased to announce the appointment of Dr. Mario Hernandez as its new Member. Mario is the successor of the long-term ISPRS and TIF Executive Officer Larry Fritz – his first term covers three years, until end of 2016. The ISPRS conference on “Serving Society with Geoinformatics” (SSG 2013, http://isprs2013-ssg.org/) was held in Antalya, Turkey, from November 11 to 17, 2013. The SSG 2013 was jointly organized by ISPRS’ Technical Commissions II, III, IV, and VII. The event included three ISPRS workshops which were scheduled to take place in the first part of the conference, namely ISA 13 - Image Sequence Analysis (11.11.13, http://www.tnt.uni-hannover.de/isprs/isa13/), CMRT 13 - City Models, Roads and Traffic (12.-13.11.13, http://www.pf.bgu.tum.de/isprs/cmrt13/), and and Laser Scanning 2013 (11.-13.11.13, http://www2.isprs.org/laser-scanning-2013/articles/ls2013.html). It was the first time, ISPRS organized such a large scientific meeting across multiple commissions in odd years. ASPRS announces the appointment of Dr. Michael Hauck as the incoming ASPRS Executive Director. Outgoing Executive Director, James Plasker, announced his retirement from ASPRS, effective January 10, 2014. Hauck becomes only the fourth Executive Director in the past 47 years of the organization’s history. Both incoming and outgoing Executive Directors look forward to working together to ensure a smooth and effective transition. Hauck has over 20 years of experience in the creation and application of remote sensing and geospatial information technologies. Reflecting the diverse membership of ASPRS, he has practiced in academic, government, Fortune 500, and start-up settings; and in industries that include transportation, energy, telecommunications, and defense. In addition to technical breadth, he is a versatile, collaborative, and adaptive leader with over a decade of general management experience that includes both board and executive positions in not-for-profit organizations. His volunteer work includes service on local, State, and National boards, e.g. the Venture West Network of entrepreneurs, the State of Wyoming Telecommunications Council, and the Transportation Research Board of the National Academies. His key scientific accomplishment has been the acquisition, processing, and interpretation of the first-ever deep seismic reflection profiles through the Himalayas, which were part of his PhD dissertation in Geological Sciences at Cornell University. Beyond training in science and engineering, Hauck is also a student of science and technology communications, and a graduate of the Wyoming trustee leadership development program. ASPRS has also informed us that Kimberly A. Tilley, Associate Executive Director and Director of Communications, passed away suddenly Friday evening, December 27, 2013 at her home in Bethesda, Maryland. To ISPRS Kim was a well known, always helpful and extremely reliable point of contact. Our thoughts and those of all who knew her, are with her family and with ASPRS. French National Meeting on UAV: "Drones et moyens légers aéroportés d'observation: recherche, développement, applications : l’état de l’art" will take place in Montpellier, France, June 24-26, 2014. The deadline for abstract submission was extended to March 10! Invitation to join WG VII/7 "Synergy in Radar and LiDAR"
The goal of the WG VII/7 Synergy in radar and lidar for 2012-2016 is to bring together researchers from both radar and lidar remote sensing, and promote the development of joint activities and synergy in radar and lidar research, such as joint and multi-temporal experiments on vegetation characterization and upscaling activities. The WG will also facilitate the discussion and evaluation of models and experimental methods by organizing workshops and providing a web page for dissemination of resources and publications, see website. Geneva, 17 January 2014 – In Geneva today, the Group on Earth Observations (GEO) received unanimous endorsement to unleash the power of open data for a second decade. There was agreement to continue building on the organization's first 10 years of pioneering environmental advances, which are designed to improve the quality of life of people everywhere. Fueled by open data, GEO's efforts are now evident in most regions of the world. GEO is comprised of 90 member nations, the European Commission and 77 Participating Organizations. Participants in the International Polar Data Forum (comprising of data managers, scientists, and research coordinators) share their observations about the current state of polar data activities and their recommendations for enhancing and sustaining core data services into the future. The international workshop was hosted by the the Belarusian State University (BSU) on behalf of the Government of Belarus and co-sponsored by the Secure World Foundation (SWF). The workshop programme included presentations that detailed the current use of the space technology for socio-economic benefits and discussed the on-going and planned initiative, discussion sessions the main purpose of which were a contribution to the creation and consolidation of existing networks and partnerships. A 1-day training describing the analytical and technological process from satellite observations to actionable social and/or economic decisions was offered to participants in cooperation with the International Society for Photogrammetry and Remote Sensing (ISPRS). ISPRS-WG VI/5 is pleased to announce the call for proposals for free FORMOSAT-2 satellite data. FORMOSAT-2 has a unique daily-revisiting capability to acquire images at a ground resolution of 2m (panchromatic) and 8m (multispectral). The images are suitable for various researches and applications. Each selected proposal will be granted up to 10 archived images and/or new data acquisition requests free of charge. Sponsored by the National Space Organization, National Applied Research Laboratories and jointly supported by the Chinese Taipei Society of Photogrammetry and Remote Sensing and the Center for Space and Remote Sensing Research, National Central University of Taiwan, This call for proposal is open to all researchers worldwide. Proposals that include ISPRS affiliated personnels (including Student Consortium members) as PI or CI (co-investigators) will be given higher priorities. Visit http://www.csrsr.ncu.edu.tw/FS2CFP for more details and to submit proposals. Aims: This workshop will focus on multi-sensory dynamic spatial information fusion from stereo sequences, visual and infrared sequences, video and LIDAR sequences, stereo and laser sequences, Inertial Measurement Units etc. Indoor applications are also welcome to submit. The event is organized by ISPRS WG III/3 on "Image Sequence Analysis". In this issue of the eBulletin, we present the complete list incl. all available dates for abstract and paper submission. ISPRS Working Group IV/2 workshop on "Global Geospatial Information"
G-ECO Research, with support of EARSeL and Bowling Green State University, are inviting PhD students and early career professionals to submit an application for Split Remote Sensing Summer School (SplitRS 2014).